Located on the outskirts of Pune, in the adjacent ‘twin city’ of Pimpri-Chinchwad, lies DoubleTree by Hilton – just about a 30 – 45 minute drive away. A 4-star hotel, DoubleTree is located right in the corporate and industrial district, with direct access to IT parks, factories, and other key business areas. That’s not all – there are also plenty of entertainment, shopping, and eating options nearby to keep you happy in your free time. The hotel houses 115 spacious guest rooms, a 24-hr fitness centre, spa, salon, outdoor pool, rooftop lounge-bar, two brilliant restaurants, a bakery-cafe counter, and even an ATM machine. For corporate and business travellers, the hotel also offers a 24-hr business centre. So even if some work comes up while you’re on a break, you needn’t worry. The rooms here are spacious, clean, comfy, and equipped with the essentials. Those with ‘executive’ or ‘suite’ category rooms can also enjoy exclusive access to the ‘Executive Lounge’ which serves ‘breakfast, evening cocktails with canapés’, and selection of snacks and beverages. 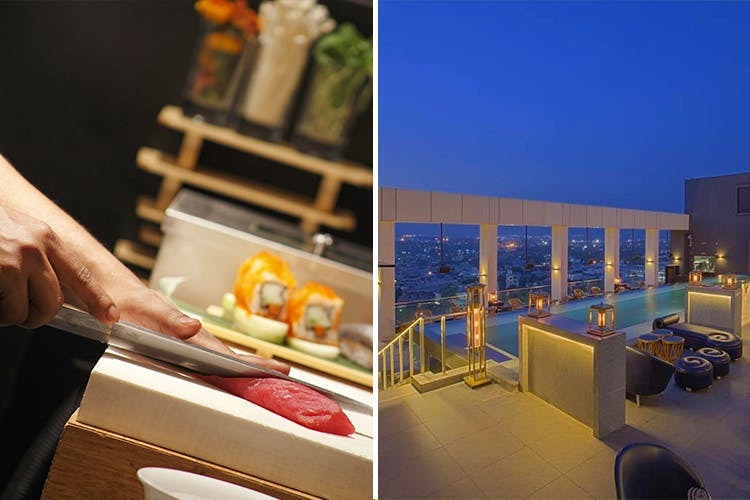 Their rooftop lounge-bar ‘Level 12’ is ideal for kicking back with an evening drink, panoramic views, and some finger-food; while their 24-hr restaurant ‘3 Spices’ caters to every craving – Indian, European, or Asian cuisine – and is popular for its Sunday brunch spread. We’ve heard rave reviews about the food here – especially with regard to the Japanese fare (particularly the sushi) at Miyuki. Coffee addicts, be sure to stop by their bakery-cafe counter ‘Tarta’ for a cuppa and a pastry! DoubleTree by Hilton is as popular with solo travellers as it is with couples – and we think it’d make a great weekend getaway for anyone looking to pamper themselves. True to Hilton hospitality, the staff here pay attention to detail – and from the ‘welcome cookie’ at check-in, to the towel-art in your room – they rarely miss a thing. If you’d rather venture out for some sightseeing than just staying in – Lonavala, Khandala, and notable sites like the historic Karla and Bhaja caves are all within driving distance from the hotel. The standard room rates are reasonable – not light on the pocket, but not too steep either.